Grgo Stojic is the only victim of a wartime massacre in the Bosnian village of Skrljevita who survived to testify against former Bosnian Serb Army commander Ratko Mladic in the Hague Tribunal courtroom. Grgo Stojic is eagerly awaiting the Hague Tribunal’s verdict on Ratko Mladic, which is scheduled for Wednesday this week, because he survived one of the crimes of which the former Bosnian Serb Army chief stands accused. Stojic was the only person left alive after a mass shooting which he says was carried out by Bosnian Serb Army troops at the Glamosnica forest in the village of Skrljevita, near Sanski Most in north-west Bosnia in 1992. He testified at Mladic’s trial at the UN court in The Hague, and is hoping for a conviction. “I doubt he has a normal or clear conscience… To me, he is not even a man,” he said of Mladic. Stojic said in an interview with BIRN that he fulfilled his “moral obligation” by testifying for the prosecution in the trial. “Why should I hide what I went through? Why not tell the truth?” he asked. Mladic is charged with being responsible as the army’s commander for the massacre on November 2, 1992, when Bosnian Serb soldiers killed several men in Skrljevita. He is also accused of responsibility for genocide in six Bosnian municipalities including Sanski Most in 1992, genocide in Srebrenica in 1995, terrorising the population of Sarajevo, taking members of international forces hostage and persecuting Bosniaks and Croats across Bosnia and Herzegovina. 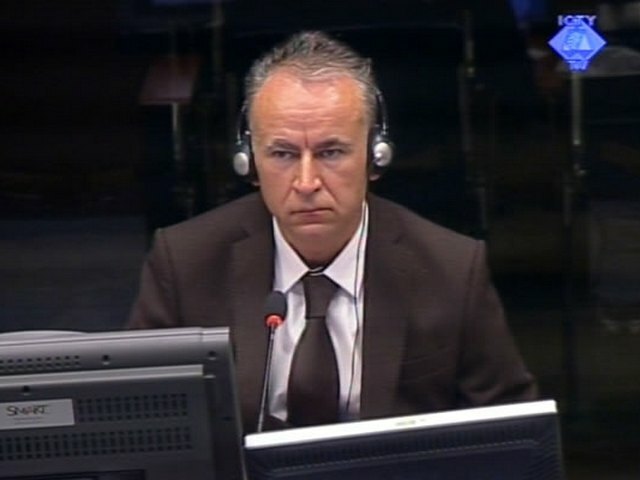 Mladic’s defence lawyer Miodrag Stojanovic has insisted that the evidence proves that the former Bosnian Serb military chief had no knowledge about crimes against humanity and killings of non-Serbs in Bosnia and Herzegovina. Stojic recalled how on the day of the massacre, he was returning to his home village of Skrljevita with his cousin Dragan Tadic when Serb soldiers armed with automatic rifles stopped them. “We said, ‘Good day.’ They did not return the greeting,” Stojic recalled. He and his cousin Tadic were then taken around 20 meters away, where a soldier was holding a rifle pointed at their neighbours Ante Tutic, Josip Banovic and Zarko and Petar Nikic. The soldiers then hit and robbed them. “We were lined up. I was the fifth in the row. Tadic was standing next to me,” he said. After the shooting, the soldiers ran away, he said, and it became clear that he was the only one who had survived the shooting. He managed to crawl to his brother’s house in the village and was taken to a local hospital. After that he was transferred to Prijedor and then to Banja Luka, where he underwent surgery. His ordeal didn’t end there, however. A few days after the surgery, Stojic was transferred from his hospital room to a prison cell inside the hospital building. “When I was brought in front of the cell, I saw some military policemen standing there. The nurse asked them where she should put me and a soldier said, ‘Just dump him on the floor,’” he said. Stojic said he was humiliated, mistreated and beaten during the course of his detention. He was forced to do the three-finger Serb salute and sing some nationalist songs. Some time later, Stojic and his neighbour were transferred from the cell to another location. In mid-November 1992, he was registered by the International Red Cross and was released to Croatia a month later. Stojic said he struggled to get adequate medical care in Croatia for months, and was eventually transferred to the US in 1994. He lives in Croatia now. He has a 70 per cent disability rating and mental problems caused by the trauma he suffered back in 1992. “I live with my brothers, who help me… I do a little bit of work, as much as my condition allows me,” he explained. Stojic still visits the village of Skrljevita several times a year, but says it is no longer what it was before the war. “Unfortunately, nobody lives in that village [any more]. It is totally pillaged and destroyed,” he said.